Eating plant protein is a hot trend and it's here to stay, especially if nutritionists have a say about it. Shifting towards a healthful, plant-based eating style (hello lentils and beans) may provide significant benefits, such as reducing risk of obesity, heart disease and type 2 diabetes. Enjoying plant protein in place of animal protein is not only good for your health, it's good for the health of the planet. Producing plant-based protein vs. animal protein requires less energy and land, and creates less greenhouse gas emissions. Studies show that when plant-based foods replace all meat and dairy, it may lower negative environmental impacts by more than 40 percent. Lucky for you, it doesn't have to be challenging or time consuming to get plenty of plant protein. 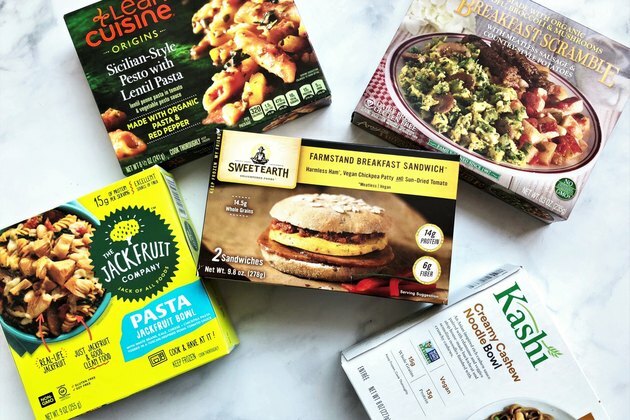 Here, we highlight nine tasty, speedy food finds from the freezer aisle that provide more than 10 grams of plant protein a pop. 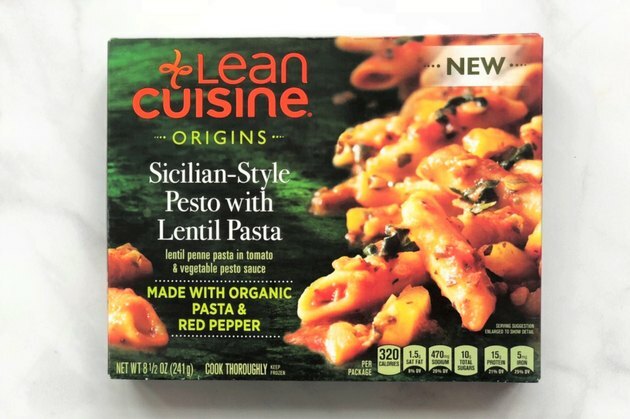 It may be unexpected, but Lean Cuisine makes an interesting vegan pasta entrée. The dish contains 15 grams of protein thanks to penne that's made with organic lentil flour. Lentils, including lentil flour, provide prebiotic carbohydrates (basically food for "good" bacteria in your gut) along with non-heme iron, which may help you fight fatigue. In fact, the entrée provides 25% of the daily value (DV) for iron. But is it delicious? You won't encounter a sub-standard "frozen dinner" taste here. The meal incorporates pumpkin seed kernels, yellow carrots and slightly sweet organic roasted red bell pepper puree. And while the portion may not look satisfying, the dish is quite satiating. To serve, transfer the entrée to a pasta bowl, sprinkle with hot pepper flakes or fresh basil, and serve with a side salad. All ingredients in this Beyond Meat frozen burger patty are non-GMO, and the main source of protein in the burger is pea protein isolate. Besides having 23 grams of plant protein, this patty is rich in several vitamins and minerals, including vitamin D.
The vegan patty does taste pretty darn close to beef — and it looks like beef, too, thanks in part to the addition of blood-red beet juice. 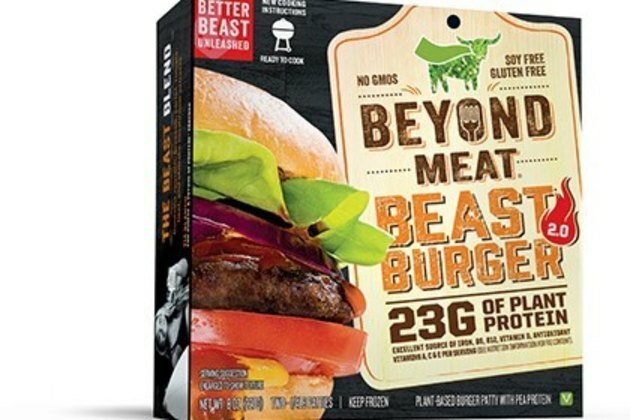 If you're a fan of the burger, do check out Beyond Meat's refrigerated plant-based sausage products, too. 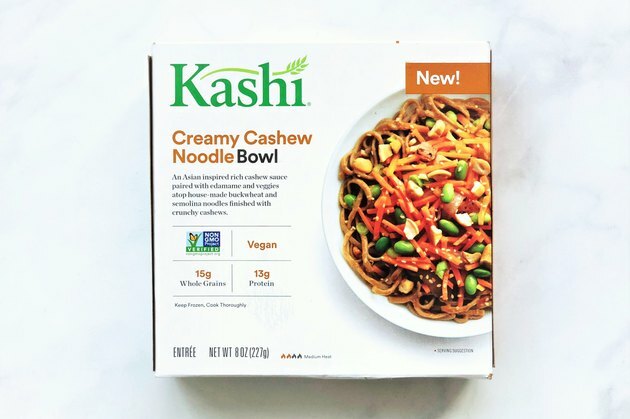 There's no need to order Chinese take out when you have this Creamy Cashew Noodle Bowl stashed in your freezer. It's even faster than take out and portioned just right. Non-GMO edamame, or young soy beans, is its key protein source. Edamame provide complete protein and may play a role in reducing total cholesterol as well as improving overall cardiovascular health. Beyond protein, this entrée features whole grains, it's a good source of fiber and iron, and it's an excellent source of vitamin A. This noodle bowl has the perfect combo of heat and sweetness. The noodles are creamy, plus they have texture thanks to the addition of cashews and edamame. To enjoy, transfer to a bowl and sprinkle with fresh cilantro and a squeeze of lime. Unless you make it at home, finding a tasty plant-based breakfast sandwich is a challenging task. 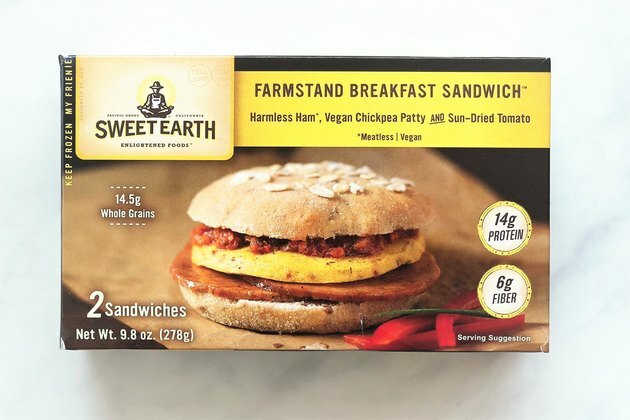 Thankfully there's this breakfast-style sandwich from Sweet Earth, which is made with their Harmless Ham™, a vegan chickpea tofu patty, and sun-dried tomato spread on flax seed bread. And although the ingredient list is lengthy, you won't find any harmful preservatives (like sodium nitrite) in this product. For some non-breakfast plant-based protein, check out Sweet Earth Veggie Lover's (vegan) Pizza or Protein Lover's (vegetarian) Pizza. Prefer an entire ready-to-go meal rather than just an entrée? 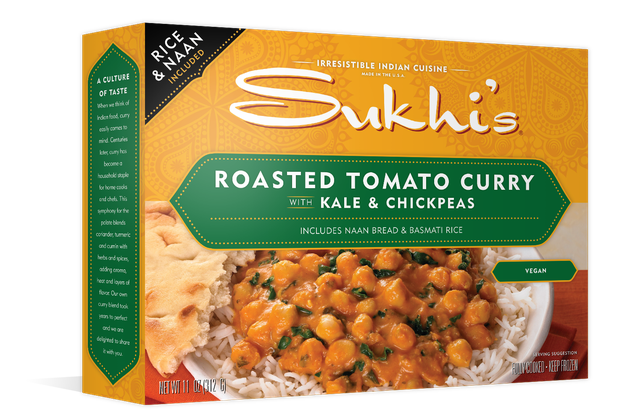 Sukhi's complete vegan curry meal is just what you're looking for. It includes naan bread and basmati rice, along with curry. It has a welcome 17 grams of plant-protein, mostly thanks to chickpeas (garbanzo beans). Due in part to their fiber content and low glycemic index, chickpeas can be a key part of the diet for people with diabetes since they may help regulate blood sugar levels. You'll find Indian-inspired aromas and flavors here, especially from the inclusion of coconut milk, ginger puree, and curry paste. Since the meal's naan and basmati rice are processed rather than whole grain, we simply suggest not eating this every day. To enjoy, just transfer the curry and rice to a bowl. No meal add-ons required. This bowl of gluten-free goodness gets plant protein from chickpea pasta, white beans, and vegetables, plus a bit from young jackfruit. The pasta is protein-packed, given that it's made with chickpeas and pea protein. Chickpeas may help reduce the "anti-nutrient" acrylamide content of some snack foods, breads, and more. Pea protein contains a significant amount of the amino acid arginine, which is important for muscle building. You'll get a bit of protein (and a lot of flavor) from parmesan cheese, too. 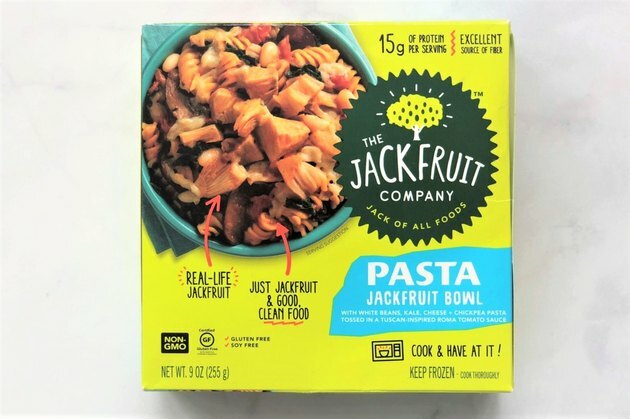 As a bonus, this jackfruit pasta bowl provides a whopping 13 grams of fiber — that's more than half of the fiber needed daily. To serve, go garlicky: stir in roasted garlic or pair with crusty garlic bread, or both. Your body needs a constant supply of protein, not just at dinnertime. So, you'll appreciate knowing that this vegan breakfast is an excellent source of the ever-important macronutrient. 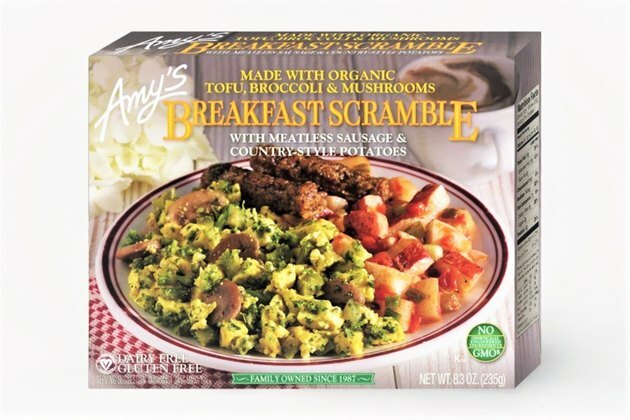 The protein in this frozen meal comes from organic tofu (which is transformed into plant-based scrambled "eggs"), garbanzo bean flour, green lentils, and quinoa. Quinoa is unique because it's considered a pseudo-grain; it provides all "building blocks" of protein, and it has antioxidant and anti-inflammatory properties. The entire meal is an excellent source of fiber and iron and contains no genetically modified ingredients or gluten. After heating, transfer your feel-good morning meal to a plate, drizzle with hot sauce, and top with avocado. Sure, you can get loads of protein from a burrito, but it's not always plant protein. 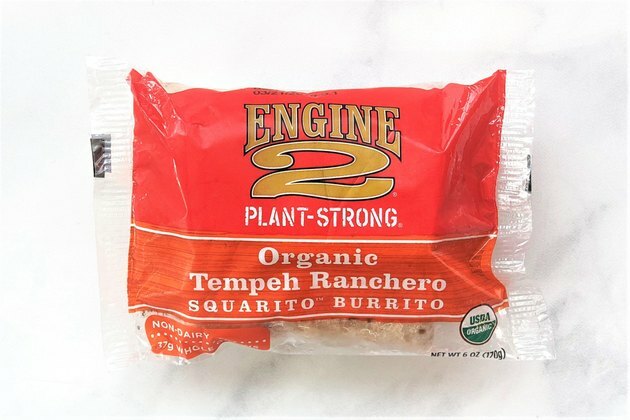 It will be if you choose this organic square-shaped burrito by Engine 2 Plant-Strong with its 12 grams of protein, all from plants. The main source of protein is organic tempeh that's made from cultured organic soybeans, barley, brown rice and millet. Because tempeh is a fermented food, it provides probiotics, which will make your gut happy thanks to "good" bacteria. This burrito also features organic black beans and the tortilla is made with 100% organic whole-wheat flour. These frozen burritos are a good source of iron and potassium as well, and an excellent source of fiber, coming in at 8 grams of fiber per burrito. Add a few dollops of guac and pair it with bean salad or mango salsa for a nourishing Mexican-inspired meal. 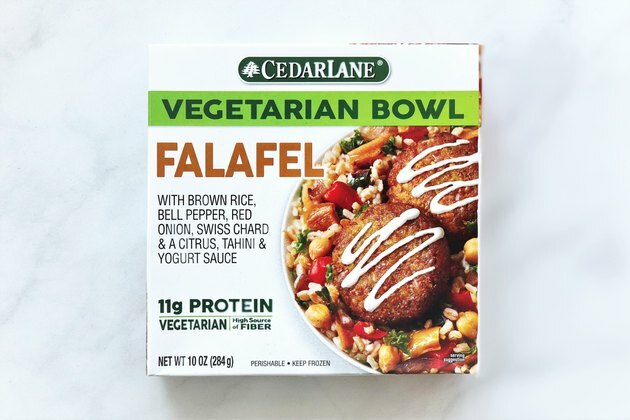 In this vegetarian bowl, the falafel, or crispy garbanzo bean patties, are both delicious and good for you. The largest percentage of the wholesome plant protein in this entree is from garbanzo beans and brown rice. Garbanzo beans count as pulses, and research finds that pulse intake offers an array of health benefits, including potential anti-cancer effects. A touch of Greek yogurt in the sauce provides a bit more protein and makes the grains slightly creamy. The bowl is enjoyable as is, but even more so with the addition of harissa (or sriracha) and fresh cilantro.